We stopped off for late breakfast en route to Wells and also visited Salisbury Cathedral. I spent around an hour inside with my camera and Ray went on a group tour with a gentleman guide who was informative and entertaining. 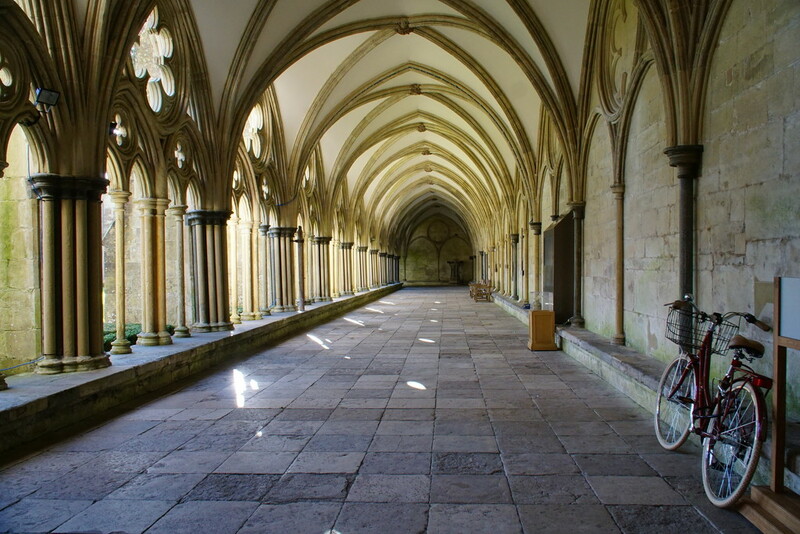 A beautiful light in these cloisters, I can understand the temptation to hop on that bike! Lovely point of view and looks as though a bike could be useful! A lovely pov and image lovely light , repetition of the beautiful archways, the flag floor and that irresistible bike -- great title ! Lovely shot and like the bike! Beautiful archways. Love your POV. Looks a great place to visit. Well captured and a great POV. Lovely composition. I love the arches. I am singing along now too. Beautiful archway....Such lovely light play on sunny days. Lovely sense of the depth of these amazing cloisters! Lovely arches and great light.